Skeptics probably mumbled about having to do a seemingly useless task…counting the available Israelites. Analysts were probably certain the tribes should be divided up differently. Doubters didn’t even want to show up for the count because they probably wouldn’t be included anyway. Complainers grumbled because their normal routines were probably going to be interrupted by something that was “un-necessary” in their thinking and they didn’t have time for. Opportunists probably saw this as a time to move to the front for recognition of their skill and value. Optimists were probably excited because finally something was beginning to take place. The hearts of the humble probably leaped within them at the hope of being able to contribute in some way…even to be a tent-peg counter! There was a reason for the count…God knew what He was doing…and He already had a plan which delegated each one to a specific work of serving and carrying. God was very specific in delegating responsibilities, and was teaching the Israelites how to do this. 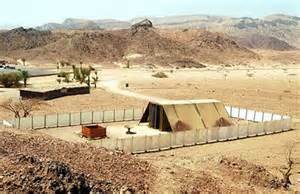 Not insignificant in the tabernacle tasks, were those who were responsible for the tent pegs! Num 3:26, 3;31, 4:36. “And everything related to their use.” Each clan had a specific job which included this in its job description. Prayer: O LORD, may I fully realize my assignment, and recognize the significance of what duty You O LORD, have given me. I am not assigned to carry the Ark of the Testimony, Bread of the Presence, Altar or Lampstand—but, whatever you assign me (ropes, tent pegs or whatever) may I be faithful and honored to carry out that responsibility to the fullest of my ability. May I use the strength and skill which You have given me.